Production Design: Visual Design for Film and Television is a hands-on guide to the craft of production design and art direction. Author Peg McClellan gives an insider’s view of the experiences and challenges of working as a Production Designer in film and television. The book covers three major areas, starting with an overview and the basics of job responsibilities, the artistic approach and the background which every Production Designer needs to be familiar with, and progressing to the mechanics of the role with a day-to-day breakdown of the job itself. McClellan takes you through script analysis, team collaborations, the hierarchy of a production, hiring a team, the business elements, locations, studio facilities, handling change and everything in between. 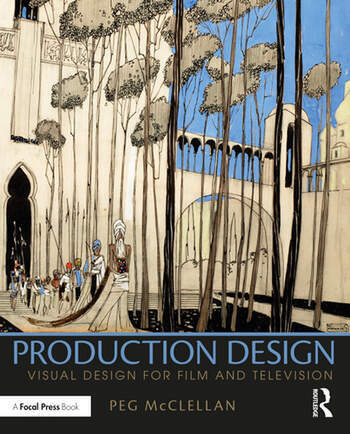 With case studies, insights from successful Production Designers, and inspiration in the form of over 200 colour photos and illustrations from storyboards to sets, this is the ideal book for students seeking a career in production design, and professionals looking to further their design knowledge. Peg McClellan is an Emmy-Award winning Illustrator and Production Designer; she has worked on feature films such as; Seabiscuit, Brokedown Palace, and Coal Miner’s Daughter plus several television series, including Melrose Place and CSI. She is an instructor in Production Design at the Academy of Art University in San Francisco and also teaches a course in Visual Design for Film at Dodge Film School, Chapman University, Orange, California. "Even the top film schools won’t give you the tools of the Production Design trade the way that this in-depth, step-by-step ‘bible' will. From ‘The Look’ to the ‘The Wrap,’ allow a working production designer to be your guide, as you gain insider knowledge usually only earned from years on the set. You’ll carry this book with you from school throughout your career."